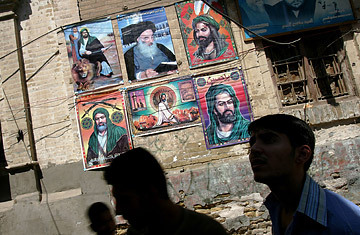 Local residents walk past religious posters near a Shiite mosque in Baghdad. The convention of Iraqi insurgents was scheduled to take place Monday at the resort-like Sahara Hotel outside Damascus but, within hours of the plenary session actually starting, the Syrian government suddenly canceled the summit. However, high-level representatives of much of the Iraqi nationalist insurgency, remained at the venue informally negotiating and laying out a framework for what a post-U.S. Iraq would look like. Late Monday evening, dozens of conference attendees  a group drawn primarily from the ranks of former military officers, Ba'athist officials, and the Sunni insurgency  gathered for a catered dinner beside the hotel's outdoor pool. Several, including a high-ranking former military officer now overseeing Ba'athist resistance activities in his region, talked openly, if carefully, about strategy, although some asked that their names be withheld. ("We are not afraid," said the former Iraqi army colonel, as waiters delivered the main course of steak and carrots, "but we do not want to give the [Shi'a] militias justification to kill us.") They said victory was in the air; one delegate celebrated the looming U.S. withdrawal over Diet Pepsi and watermelon slices. "This gathering here is unprecedented. When this conference occurs, it will be historic," said Sarmed Abdel Karim, founder of the popular iraq4all website and a non-insurgent who calls the gathering one of "the Iraqi opposition." "It will be the cornerstone of a new Iraq." "The American project in Iraq is now precarious," said Nizar al-Samarai, a conference spokesman and former official in the Saddam Hussein regime. "We are sure of our victory now, so we decided to meet." Samarai and others described a new kind of resistance activity  a more deliberate and organized coordination between the political and military elements of the insurgency, as they look past guns to governance. "One arm now knows what the other is doing," he said. The broad strokes of some their demands were familiar, but many were now relayed in greater detail. Attendees said they remained committed to ending the U.S. military presence "by all means" and eliminating all vestiges of American influence, including the current political process. Once the majority of American troops have left, the alliance plans to throw out the constitution, dissolve the parliament, cancel all resolutions issued from the Bremer era on, and disband the existing security forces and U.S.-trained Iraqi army divisions. The U.S. embassy in Baghdad, they said, would have to close  "as in Saigon. With helicopters on the roof" said Samarai  until Washington recognized a new, resistance-led Iraqi governing council, and offered compensation to all individuals and organizations affected by the war. Under the new leadership, all Iraqi citizens who worked for or cooperated with the current, coalition-backed government would be arrested. A "reconciliation council", drawn in large part from the ranks of the armed insurgency, would then draw up plans for a permanent "technocratic" government � which would immediately seek criminal charges and file civil suits against the U.S. government and major American war supporters in international court. The summit had been described by organizers as the most ambitious gathering of the movement to date. It came within weeks of a decision by several Sunni groups  including the 1920 Revolution Brigades, Iraqi Hamas and Ansar al-Sunna  to unite in advance of an expected American military withdrawal, and meet in Damascus to unveil their new alliance. Conference organizers said that this week's event fell victim to logistical hurdles. Less than 200 of the 600 people invited showed up, a result of coalition roadblocks and security measures as well as the fear of reprisal from government forces after their return. But more than one delegate said that these obstacles had been less problematic for most no-shows than remaining philosophical differences on a range of issues, from foreign relations to power-sharing. So the mood at the Sahara was more circumspect than celebratory, the rhetoric directed at the American audience more measured. One delegate, a former army officer who asked to be referred to as "Abu Ali", even admitted that he had a sister in Florida, and said he would come to the U.S. himself if he could. "America doesn't leave a country by force," said Samarai. "Bush has been in a hole, digging deeper. So every year, it has become more difficult for America to leave Iraq. But what the muqawimma [resistance] movement has done is more than America can bear. Now there is not only a military battle in Iraq, there is a political battle in the U.S." That part of the battle, he said, was nearly over. As for their summit, the delegates insisted it was merely postponed not cancelled. It will eventually be held  though perhaps not in Damascus.